I sat down to read Sandor Katz’s “Wild Fermentation: The Flavor, Nutrition, and Craft of Live-Culture Foods” to help me along with my recreational pickling and fermenting skills. I was hoping to learn a bit about the how-tos when making cheese, meads, bread and kimchi. To my surprise and pleasure I found myself reading a cookbook plus a manifesto –– a guidebook to reclaiming our food supply and living a self-sufficient lifestyle. An unconventional cookbook, a mission statement with recipes, and a manual to reclaiming the microbial nutrients in our diet, Sandor Katz (also goes by Sandorkraut) supplies a simple, subversive and tasty vision for helping to change and preserve our world through fermenting our food at home. As he writes of the bubbles that fermentation produces, he himself bubbles with excitement over “doing it yourself” and taking yourself out of the industrial food chain. What makes Sandorkraut’s work so relevant and inspiring is his own personal story, which he slowly weaves into the book chapter by chapter. Fermentation is not his only method of combating AIDS, but it is one that he considers to be of the utmost importance to his personal health and body’s resistance to the disease. His giddiness and glee over fermentation, which for him is “a health regimen, a gourmet art, a multicultural adventure, a form of activism, and a spiritual path, all rolled into one,” is simply moving. So what exactly is fermentation? Well, it is the age-old process of preserving and processing foods by harnessing the power of naturally occurring bacteria and employing them to begin the process of breaking down our foods. We all eat yogurt from the supermarket with acidophilus, not necessarily realizing that yogurt is just one of many live-culture ferments rich in pro-biotics. In fact, Sandorkraut includes various yogurt recipes in his section on dairy ferments. This ancient process makes foods like cereal grains and vegetables much more nutritionally accessible to the human body. “Fermentation not only preserves nutrients, but it breaks them down into more easily digestible forms,” he writes. He cites soybeans as an example of a protein-rich food that is virtually indigestible unless the complex proteins are broken down into digestible amino acids, which explains the Asian food ferments of miso, tempeh and tamari. Perhaps an even more poignant reason to ferment that Katz cites is pure common ecological sense: food preservation. Organisms produce bio-preservatives such as alcohol, lactic acid and acetic acid during fermentation that retain nutrients and prevent spoilage. With rising food prices and at home gardening on a rise, an abundance of fruits and vegetables can last an entire year if properly pickled, jammed, brewed, etc. In fact, as the controversy over Shmitta was heating up this past fall in Israel, I wondered whether or not an Israeli fully in touch with its own culture of live-culture fermentation could properly preserve the right foods and not need to find intricate Talmudic loopholes to make it through the year. Sandorkraut takes the reader chapter by chapter detailing the various methods of fermentation (i.e. chapter 5 – Vegetable Ferments; chapter 8 – Breads and Pancakes). He also gives a somewhat simplified and generalized history of fermented foods and our modern food culture that offers interesting little tidbits about food history and culture. However, as a whole this recipe book and call to social change wrapped up into one was a page-turner for me from day one. I nearly cried while reading one of his final chapters about coming to terms with death in nature, in which he includes a few words about what he’s learned from living with AIDS. The book was an unexpected treat that will rest on my bookshelf and not just in my kitchen, because as much as I hope to utilize his non-didactic approach to food preservation, I hope even more to internalize Sandorkraut’s revolutionary message and vision. 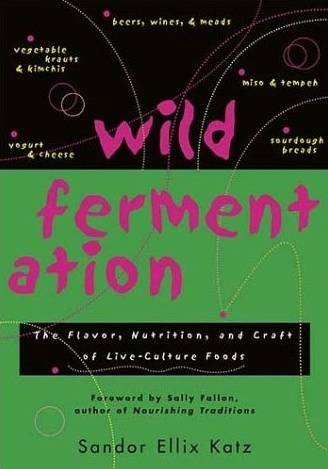 ‘Wild Fermentation’ is distributed in the UK by www.greenbooks.co.uk, and published in the US by Chelsea Green. Jeff Yoskowitz is a writer & filmmaker, living in Tel Aviv for a year on a scholarship from Brown University. Jews relationship with pigs, and food and health in general, are some of the issues that really fire Jeff up. Haaretz, The Forward and Meatpaper are some of the recent places Jeff has published his articles.